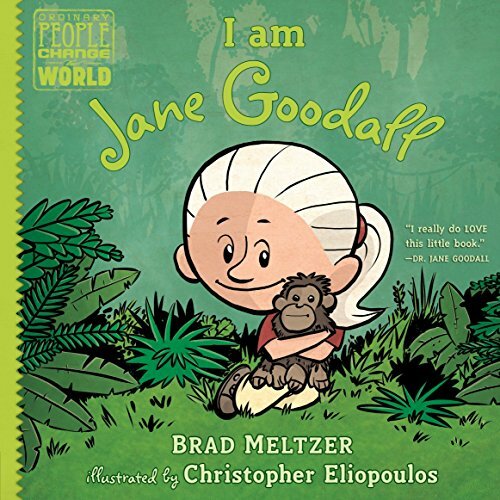 In the book, Meltzer lays out the complete timeline of Jane Goodall’s life, from the time she receives her first cuddly toy chimpanzee while she’s still in her baby buggy, to when she hides earthworms under her pillow to keep them safe, to how many times she read The Story of Doctor Doolittle and developed a desire to work with animals. Although this book is a testament to what Jane wants out of life, what she had to do to get it, and how long she had to wait to achieve her goal—and although children will certainly identify with this longing and will be encouraged to map their own dreams and work toward making them come true—it must be mentioned that it takes a very long time to get these points across. In fact, this book seems unusually long for very young readers, possibly because it does not simply touch upon the highlights of Goodall’s life, but attempts to tell her entire story under the label of “picture book” when it might have been better billed as a graphic novelette or a comic book. The deep and rich illustrations by artist Christopher Eliopoulos capture the lush fullness of jungle foliage, the strangeness of distant lands, the thrill of learning about life in general, and the innate curiosity of young Jane Goodall as she hides worms under her pillow or gets a front-row, in-your-face-view of just where eggs come from when the chickens are laying. Every creature (human, dog and chimpanzee) smiles invitingly, encouraging young readers to flip those pages to continue the adventure. However, one curiosity is that Jane Goodall’s image never changes throughout the book. She begins life white-haired and “wise-looking,” even from her baby buggy, and remains the same as she gets older. She never gets taller, even when she is a grown woman and is finally speaking with her workers in Tanzania—an image that may confuse young children into thinking she was still a child when she began her work overseas. On the other hand, her perpetual smallness throughout the book may be an attempt to keep young children feeling connected with her character, which is understandable. These issues aside, I Am Jane Goodall is definitely a book “full of living.” It covers many concepts that can be discussion-starters in an early elementary class, including female occupations, how to prepare a young nature-lover for a career in caring for animals, the care, feeding and raising of poultry, books (like Dr. Doolittle) that inspire occupations with animals, animal conservatories, overseas travel, living in other countries, and myriad other concepts.